Studio Arts Boulder was featured on KGNU Independent Community Radio this morning during the call-in show "Connections." Host Fiona Foster interviewed Executive Director Kari Palazzari, Pottery Lab Director Aaron Winston, and architect David Barrett. The hour-long show touched on the history of the Pottery Lab and it's transition to an independent nonprofit, the benefit of arts programs for individuals and the community, and plans for the second Studio Arts Boulder facility at Diagonal Crossing. Click the play arrow to hear the complete interview or download an MP3 of the show to listen offline. Enter your name and email address to sign up for the Expansion Mailing list. We'll send the latest news and updates directly to your inbox. 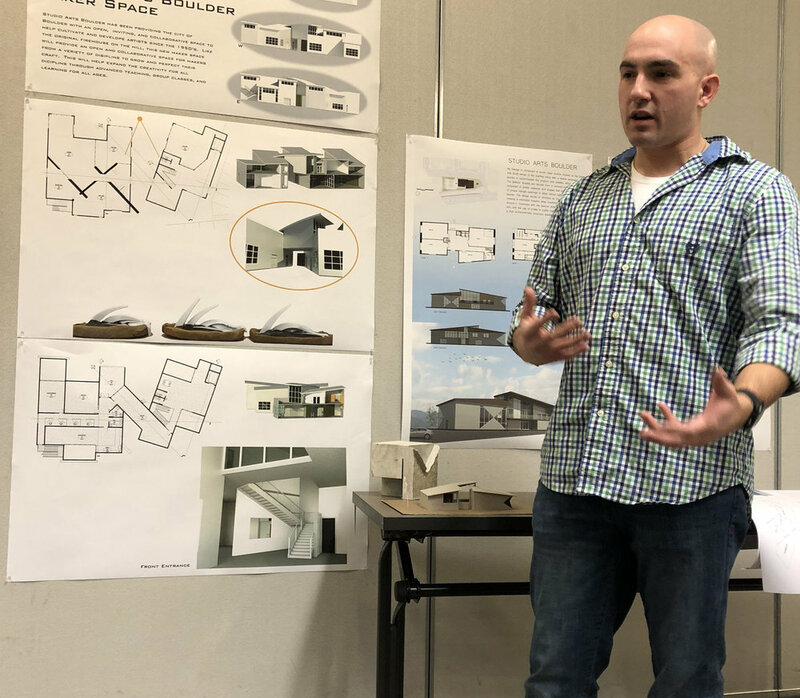 An architecture class at CU Boulder taught by Stephen Eckert used the Studio Arts Boulder capital expansion as their project for the fall semester. The class began with a tour of the Pottery Lab facility and meetings with Executive Director, Kari Palazzari, and Barrett Studio Architects to learn about the needs for the second facility at Diagonal Crossing. Students began with a conceptual sculpture to represent the “feel” of their design approach. 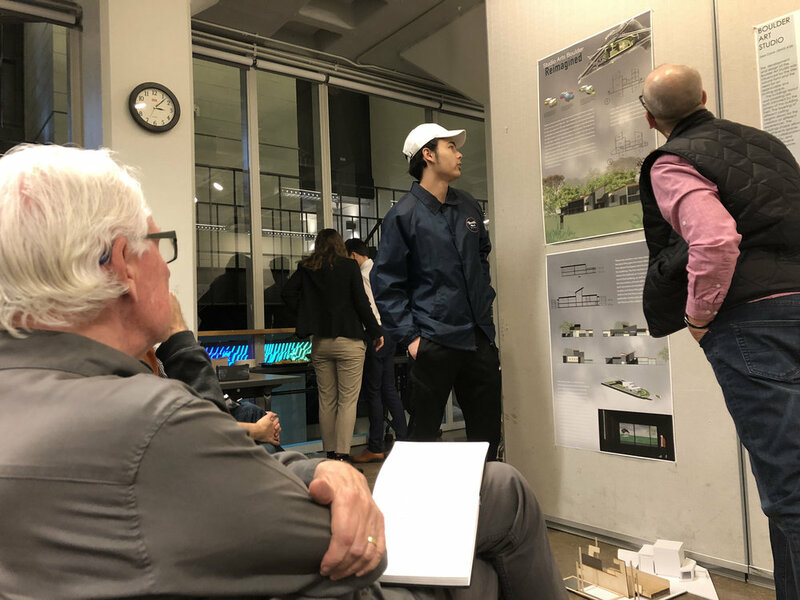 Palazzari and Board Member Tamara Layman, who is also an architect, visited the class near midterms to hear from each student about their initial design. David Barrett & Rich Keilman attended the final presentations to give professional critiques of each student’s work. While the designs varied widely, each student successfully captured the essence of the building - materials, light, collaboration, and art. 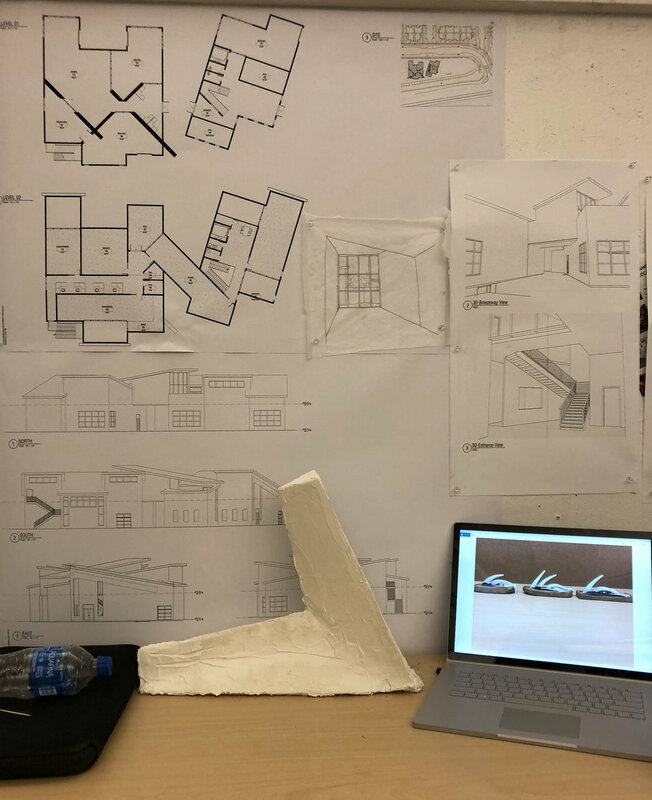 Barrett Studio architects’ first draft of the concept design for the new studio art facility was revealed at the Chili Bowl street party on Sunday. An animated slide show depicts the basic street views from the neighborhood and the highway. Color drawings highlight the use of materials, which mirror the different artforms taught inside the building. To read more details about the plan, visit the Concept Design page. This morning, Trammell Crow Residential officially broke ground at the Diagonal Crossing development. The neighborhood will include affordable and market-rate apartments, a facility for Meals on Wheels, housing for Naropa faculty, and a restaurant operated by Bridge House. 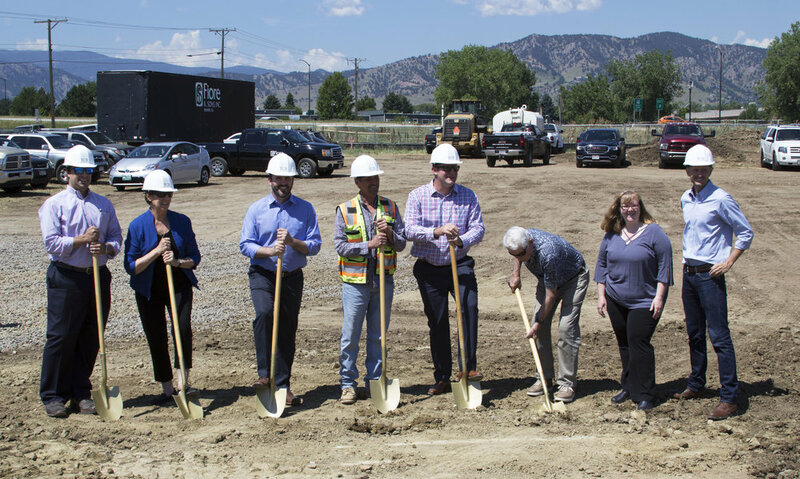 Work is already underway to complete a bike & pedestrian underpass that will connect the neighborhood to Fourmile Canyon Creek and the Cottonwood Trail. Studio Arts Boulder owns Lot 2 in the development, future site of our custom-built facility for community art education. Read more about our expansion plans HERE. We are thrilled to announce that Studio Arts Boulder is now the proud owner of Lot 2 in the Diagonal Crossing neighborhood. The real estate transaction closed this afternoon, fulfilling the lead gift of land pledged two years ago. With this valuable asset in hand, and the $1.75 Million in tax matching funds passed by Boulder voters last November, nearly two-thirds of the total expansion project is secure. Today's closing is a critical milestone and helps establish a strong starting point for the upcoming capital campaign. In addition, owning property in Boulder helps secure the legacy of the organization and the Pottery Lab. This is an important achievement in itself. Studio Arts Boulder is immensely grateful to Trammell Crow Residential and Allison Management for making this gift possible. “With our political climate, people have wanted to disconnect from that, put their phones away and actually do something physical, tangible and with their hands,” says Aaron Winston, Director of the Pottery Lab. Kari Palazzari, Executive Director of Studio Arts Boulder, speaks to some of the overarching benefits of taking lessons at the Pottery Lab, including finding a community where she could connect with people of different political viewpoints and backgrounds. “It breeds empathy and connection across difference, which is critical for building community and for our civic conversations to be more civil and productive,” Palazzari says. Read the full Boulder Weekly article at THIS LINK. All interested survey participants will be entered to win one of three $100 gift certificates to Studio Arts Boulder. Please also send this survey link to your friends and family members. We are hoping to capture as many opinions as possible during this process. On April 10th, the City of Boulder approved infrastructure plans for the Diagonal Crossing development, including streets, utilities, and other technical aspects of the neighborhood. This critical step triggers several important aspects of our expansion. The closing date for our lot donation is now set for this summer. And we can also begin the architectural concept design for our building with Barrett Studio. To kick off the design process with Barrett Studio, our internal working group will compile key takeaways from our site visits. We went to CU Boulder, CSU, Red Rocks Community College, Art Student League of Denver, Downtown Aurora Visual Arts, and Pittsburgh Glass. At each location we gathered notes and insights about what works and what doesn't. Now it's time to put those notes to use. Here are a handful of the many photos we took at each location. January 29, 2018 - Site visits to other studio art facilities have begun! The architectural working group has started visiting other studios to see what we can learn from their design. The first stop was CU Boulder's Art Building, which houses print, metal, wood, and ceramics all in the same building. We gathered photos, video, and tons of notes about what to do (and what *not* to do!) in our new building at Diagonal Crossing. The faculty and staff was very generous in showing us their space and answering our questions. The working group will apply what we learned to our upcoming concept design process. Stay tuned for more photos and updates as we move forward! November 8, 2017 - Boulder passes 2M & 2N by wide margins! We are thrilled to announce that Boulder voters overwhelmingly approved ballot measures 2M & 2N last night, bringing $1.75 Million in matching funds to Studio Arts Boulder for our expansion project! Ballot issue 2M extended the Community, Culture, and Safety tax for another four years and was passed with over 81% of the vote - a huge percentage even for a tax renewal! Ballot issue 2N provides the City with bonding authority so matching funds can be distributed sooner. Together these measures will funnel $42 Million of tax revenue into 13 capital improvement projects, including ours! Passage of the tax extension means we have 65% of the funding for our $5 Million project secured - $1.5 Million from the land donation and $1.75 Million in matching funds! A capital campaign to raise the remaining funds will get underway in 2018. To find out more about this exciting news, read the Daily Camera article HERE. Detailed information about all the projects funded by the tax is on the City of Boulder website HERE. To read more about our plans, visit the Expansion Overview page. Be sure to watch your mailbox for your official election 2017 ballot. Voting YES on 2M & 2N will help shore up needed SAFETY services, enhance Boulder’s CULTURAL amenities, and broaden the reach of COMMUNITY facilities by investing in capital improvement projects that benefit a broad cross-section of the community. 2M does not increase taxes, it simply extends a small portion of the existing sales tax to make much-needed investments in our community. In 2014, voters approved a three-year tax of three cents on a ten dollar purchase for capital investments in community, culture and safety projects. The revenue funded improvements to University Hill, Chautauqua, the Dairy Arts Center, the Museum of Boulder and the Civic Center that have amplified Boulder’s cultural vibrancy, improved our quality of life, and enhanced economic vitality. 2M extends this small tax through 2021 to fund capital investments in safety services, cultural amenities and community facilities. 2M is a wise investment in our community. A twelve-person citizen advisory committee and Boulder City Council vetted the project package in an open public process. The city has a proven track record of delivering on its voter-approved capital improvement projects and the non-profit organizations receiving assistance must raise matching funds and meet rigorous criteria before funds will be released. Let’s build on the successful momentum of Boulder’s Community, Culture and Safety tax. Together we can help preserve and protect the community we love! Please vote YES on 2M. 2N will help the community save money by completing capital improvement projects faster. With construction costs rapidly increasing, the 2N bonding authority will help provide flexibility to achieve cost savings by starting Community, Culture and Safety capital projects sooner. The bonding authority will be used to allow shovel ready capital projects to begin construction while tax revenue from 2M accrues. The city will repay any debt accumulated with tax revenue collected from 2M over its four year term. Studio Arts Boulder is pleased to announce that Kari Palazzari will be taking the position of Executive Director, reporting to the Board of Directors. Palazzari will have oversight of the strategic direction, expansion, and administration of the organization, which currently operates the Boulder Pottery Lab on University Hill through a contract with the City of Boulder Parks and Recreation Department. Palazzari has served the organization as Board Treasurer for nearly two years, helping transition the Pottery Lab from a city-run program to an independent non-profit organization. Palazzari’s professional background is in non-profit management and leadership consulting. She's helped launch both for-profit and nonprofit organizations. Prior to moving to Colorado in 2006, Palazzari earned a law degree from the University of North Carolina at Chapel Hill and a Certificate in Non-Profit Management from Duke University. Earlier in her career she provided marketing communications and project management services to for-profit and non-profit organizations. We want to hear from you. Please use the comment form below to send your thoughts, reactions, ideas, and feedback about the expansion plans. Thank you for sending us your feedback about our expansion plans. Please come back to our Expansion Updates page often to check on our progress and see what's happening!